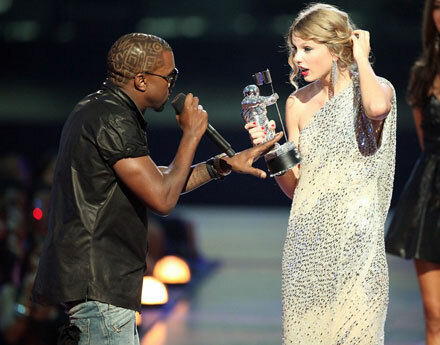 A year since he infamously interrupted Taylor Swift‘s acceptance speech at 2009 MTV Video Music Awards, Kanye West has taken to Twitter to announce the good news – he’s grown up, he knows he’s an a**hole, he knows people hate him and, what’s more important, he’s here to change it! Kanye has said he’s got a song for Taylor Swift that he’s written specially for her. This song is his way to apologize for last year’s embarrassment. I wrote a song for Taylor Swift that’s so beautiful and I want her to have it. If she won’t take it then I’ll perform it for her. She had nothing to do with my issues with award shows. She had no idea what hit her. She’s just a lil girl with dreams like the rest of us. She deserves the apology more than anyone. We’re both artist[s] and the media and managers are trying to get between us. Everyone wants to capitalize off this [in] some way. When I woke up from the crazy nightmare I looked in the mirror and said GROW UP KANYE … I take the responsibility for my actions. I am not a bad person. Even in that moment I was only trying to do good but people don’t always need my help. Beyonce didn’t need that. MTV didn’t need that and Taylor and her family friends and fans definitely didn’t want or need that. Even now a lot of articles start there first 2 paragraphs about how much of an a**hole I am. Some people’s truth is Kanye is racist… It’s not my truth but I do believe it’s my Karma. People booed when I would go to concerts and the performer mentioned my name. If you google A**hole my face may very well pop up 2 pages into the search. I’ve hurt, I’ve bled, I’ve learned. I only want to do good. I am passionate I am human I am real. I wish I could meet every hater. I wish I could talk to every hater face to face and change there a opinion of me one conversation at a time. I wish they all knew how much I really cared about music and pop culture and art and peoples feelings. I wish they could accept that I’ve grown and only want to do good for the world. I want to help as many people as I can. I want to help starting with the music and ending with the smile. I want to win there hearts back so I can continue to bring my take on culture to the masses with a clean opinion. West sounds sincere. Hope he’s really grown up. Will Taylor Swift forget him? I believe she already has. Besides, that VMA rant has given both of them so much publicity that there’s nothing to apologize for.